This is an artist's rendering of what a redeveloped Lunn and Sweet Building could look like as a medical tourism destination. Chinese Investment group Miracle Enterprises purchased the building, formerly known as The Barn, this summer. The rendering was displayed on a fence that now surrounds the building. 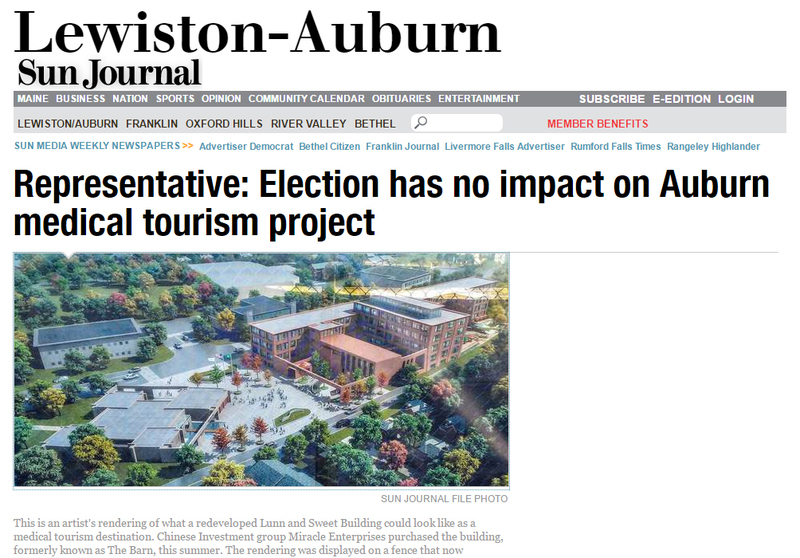 It's unclear what President-elect Donald Trump's relationship with China will look like once he takes office, but the representative for a proposed Chinese medical tourism facility in Auburn said he does not believe the recent election will affect the $40 million project. The project, slated for the old Lunn and Sweet Shoe Factory on Minot Avenue, would be built with money from wealthy Chinese investors looking to move to the United States and would serve rich Chinese patients seeking medical care from Central Maine Medical Center in Lewiston.